Can myths bring humans to understand and accept birth, growth and death? Were ancient myths were designed to “put the mind in accord with the body, and the way of life in accord with the way nature dictates.”? In the third episode of The Power of Myth, Bill Moyers and mythologist Joseph Campbell discuss primal mythologies, rites of passage in early societies, the role of mystical shamans and artists, and the decline of ritual in today’s society. Joseph Campbell was fascinated by the enigmatic art created by our ancestors of the archaic world of the Palaeolithic era, deep in caves below the earth. 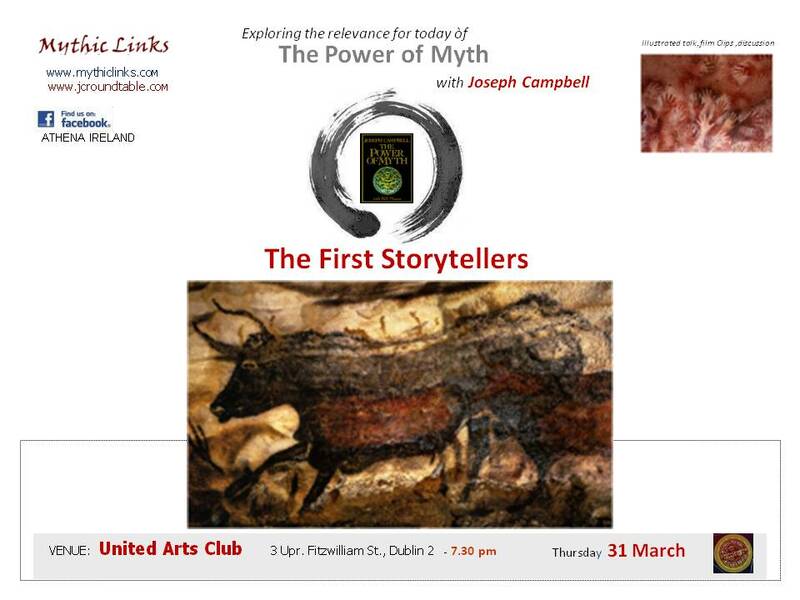 The birth of IMAGINATION – looking back and LOOKING FORWARD–join us in a time week when we are invoking and evoking Ireland , also celebrating the legacy of Joseph Campbell on his birthday. From the caves of Lascaux, which have been called the ‘Sistine Chapel of the Palaeolithic‘….to the artists of today. Humans have been creating art for over 30,000 years. The 20th century artist, Picasso was influenced by the primal images found in the caves . Can hints from cave-painting also be found in the work of the Irish artist Louis le Brocquy….? Are there stories of Irish SHAMANS? The Power of Myth was one of the most popular TV series in the history of American public television, and continues to inspire new audiences and creative artists.